Pinus densiflora 'Golden Ghost' is a robust, broadly upright selection of Japanese red pine with dense branching and stunning soft needles, variegated with bands of yellow and creamy white. A fairly new plant in the international nursery trade, it is considered among the best of the variegated pines. After 10 years of growth, a mature specimen will measure 6 feet (2 m) tall and 4.5 feet (1.5 m) wide, an annual growth rate of 6 to 8 inches (15 - 20 cm). In spite of being fairly new to cultivation, the cultivar is of unknown origin. It's earliest mention seems to be from 2003 in the Stanley and Sons catalog. 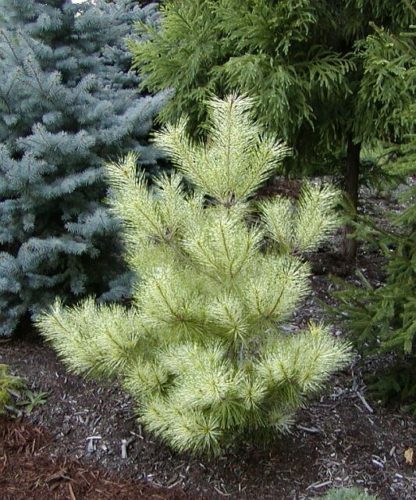 Pinus densiflora 'Golden Ghost'— a small specimen in a garden setting. 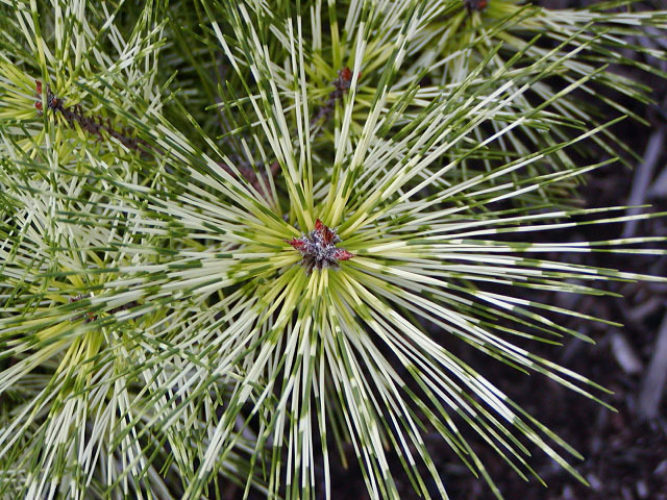 Pinus densiflora 'Golden Ghost'— a closeup of foliage detail. Notice the coloration at the center of the needle cluster.